Premise- Two contestants separately compete in an extreme version of the contestant’s own amateur video stunts against one of the show’s resident “numbNuts”, Crazy Mike, Horse, or Victor. Whichever contender can perform the stunt better or faster in both rounds will win $2,500 and will advance to the Final Stunt round. In the final stunt, the two winners in the first two rounds compete against each other in one final challenge. The winner of the final stunt wins an additional $5,000, boosting their day’s winnings up to $7,500. The moment I had finished viewing the first episode of numbNuts, I noticed that this show is simply a fusion of Pros vs. Joes, Jackass, and Fear Factor with a hint of American Gladiators. This show is surprisingly entertaining for a number of reasons: it showcases ordinary people doing impressive and not completely idiotic stunts, the humor revolving around the show’s three main characters (putting emphasis on the term “characters”), and the challenging, amped-up versions of the contestant’s amateur stunts with a decent cash payout for a half-hour digital cable game show. 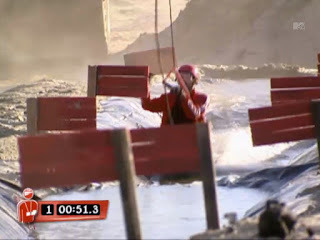 The physically-demanding and extreme stunts are very similar to Fear Factor. The second factor which sold me was the amusing, comedy aspect of the show, namely with the antics of the numbNuts. Crazy Mike, Horse, Victor are a lot like the Jackass version of The Three Stooges and remind us that slapstick comedy is not dead. In a way, I’m a bit surprised that these three haven’t had their own series yet, if a spinoff isn’t already in the making. The only complaint I have about this show are the safety measures for the stunts. Although these stunts are deservedly challenging, they could use more safety measures for these dangerous stunts. For example, one the stunts performed involved the contenders riding a bike across a plank 50 feet above the ground with two of the numbNuts posing as human pendulums trying to knock the players off the platform. The problem with this stunt: not a single person was wearing a helmet. Although everyone was wearing a safety harness, there was still a chance that the harness could have snapped and the stunt would have went downhill quickly. Overall, numbNuts is a good physical stunt game show where people are awarded for performing amateur stunts. Jeff Dye is average at best when it comes to hosting this series. numbNuts is a cool, extreme game show without it being too ridiculous and idiotic or crossing the line. This is what Fear Factor would look like if it were a half-hour series. I can see this show lasting for at least two seasons, but we’ll see what happens. Watch new episodes of numbNuts every Thursday at 9:00pm on MTV2!